RoyalSlider is easy to use jQuery image gallery and content slider plugin with animated captions, responsive layout and touch support for mobile devices. As navigation you can use thumbnails, tabs or bullets. Use it as image slider, slideshow, HTML content slider, gallery, banner rotator, video gallery, carousel or even presentation. Developed in best practises of HTML5, CSS3 transitions are used for all animations (with fallback). Note about support: all support requests about related to RoyalSlider are answered only through forum. Questions that asked directly through email, or comments section might be missed or answered with delay. New version of RoyalSlider for WordPress finally released! 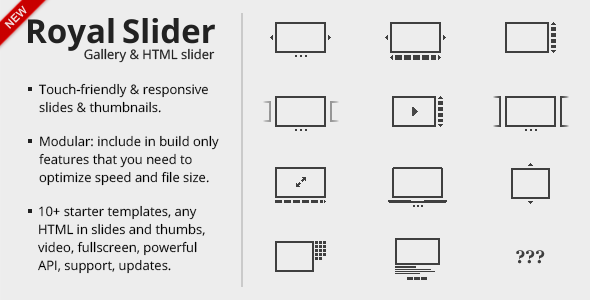 Latest version of slider: 9.4.8. Added jQuery 1.9.x support. Latest version available on CodeCanyon: 9.3.5 (version on CC is updated too, but with delay). Visit changelog page to learn more. Latest version of JS file you can get from RoyalSlider build tool. Script is used by top agencies and brands around the world, scroll down to see real world examples. Check out plugin review by DailyJS if you have questions about code quality or visit RoyalSlider website for full feature list. Touch navigation support for iOS, Android, IE10 (Windows 8), Blackberry and other. SEO optimized and semantic, images are indexable, completely any tag names for markup, captions can use any tag you want (“h1”, “h2”, “p”…). Share the post "RoyalSlider – Touch-Enabled jQuery Image Gallery"